In ancient Athens more than two thousand years ago, Greek philosopher Socrates was put on trial. He was charged on two accounts. First with disobeying the Gods and also with corrupting the youth of Athens. Plato is a student and follower of Socrates and the trial is well documented in his work ‘Apology’. If all these sounds greek (geddit?) to you, just know that Socrates was one heck of a chap. Some accounts paint him to be pompous and insufferable, a flaneur unable to hold down a proper job. Others picture him a maverick, one who goes around asking pointed questions in order to derive the truth (and getting under people’s skin in the process). Yet another version puts him as highly learned and introspective, thinking way ahead of his time and contemporaries. If it still does nothing for you, imagine Nassim Taleb doing his thing clad in a toga. That is the closest you can get. Anyways, the story begins when Chaerephon, a friend of Socrates asked the Delphi Oracle (think High Priestess, Spiritual Leader, Moral Compass) if Socrates is the wisest person in Athens. The Oracle responded positively – Yes, Socrates is indeed the wisest, she said. There is no doubting that. Her response bothered Socrates to no end. Whatever does the God mean? What is his riddle? I am very conscious that I am not wise at all. What does he mean by saying I am the wisest? Socrates knows the boundaries of his knowledge. He knows that there are many things he does not know. How can someone so ignorant be deemed wise? He set out to investigate. So he went up to a wise man in Athens and examined him, and discovered that while he appears wise to many, in actual fact he is hardly wise. He did the same thing with other ‘wise’ people like poets and craftsmen. He realised that ‘bystanders have explained the poems better than the poets themselves’. And craftsmen, ‘because of their success at their craft, thought themselves to be wiser in all other important pursuits, and this overshadowed the wisdom they had’. Socrates soon came to a realisation. He knows that he does not know much. He also knows that other supposedly wise people do not know much as well. But in recognising that he is ignorant versus other people insisting on protecting their ‘wisdom’, he is indeed wiser than most others. Socrates might have existed more than two millenniums ago but the human need for definitive answers remains unchanged. I noticed that when attending funerals, the most common question everyone asks is ‘What Happened’. It is not out of concern for the family members and seriously there are far better attempts to be made at small talk. The question makes no sense other than to satisfy our own perverse sense of knowing. It belies our need to know and to have an explanation for everything that is happening around us. On a less morbid topic, I have also noticed that when my nieces come home with less than stellar results for their daily school assessments, the first thing their mother would ask is – Why. Some of you might say it is important to know so as to do better next time. Fair enough, but when the answers remains unchanged day in day out, one wonders if the questions are just an attempt to seek confirmation and closure for the adult rather than improvement for the child. More seriously, the need to know has dictated how we consume news. Knowing what has happened (fact) is not good enough. Knowing how and why something is happening (interpretation) remains just as key. Here is an article in our mainstream media that reports on Shunfu Ville being sold en bloc for $638 million. It not only reports on what happened, but also attempts to tell us why what happened, happened. We need to know things. We need firm answers. This is how we make sense of the strange strange world we live in. The need for firm answers have spawned an entire schools of industry experts (it does not matter which industry they are from). Be it predicting the outcome of an election or whether the Fed would raise rates or even coming up with the implications of an en bloc sale, we have become all too reliant on experts for their views. To the extent that the line between fact and interpretation is muddled and no longer clear in our own heads. 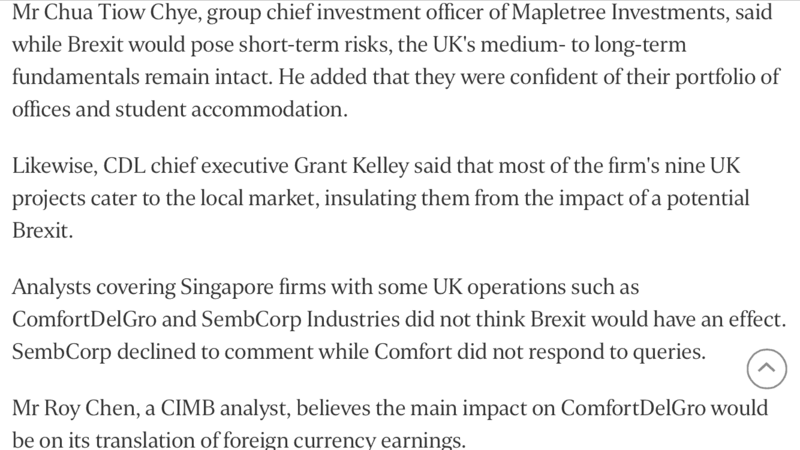 Here is another interesting article from yesterday, the title – Brexit unlikely to have a big impact on Singapore says it all. Experts help us make sense of the world by providing answers to the burning questions in our heads. They not only help us look back, but also help us paint a picture of the possible future. More often than not, they turn out to be more interpretations than facts, more opinion than evidence. As long as there is demand for experts and their wise opinions, there will be no lack of a supply. Two thousand over years ago, Socrates warned us against wise men and their purported wisdom. For his exposure of the broad intellectual corruption amongst those in power, he was sentenced to death by the jury. As we sit here in modern day comfort reading about his exploits, let us not forget that the self righteous ‘wise men’ and ‘experts’ he has tried so hard to warn us about is still very much in our midst. If Socrates is to be believed, the mark of true wisdom is being in acceptance of one’s ignorance. What then can we make out of these experts who claim to have an answer to everything? Your take is as good as mine. 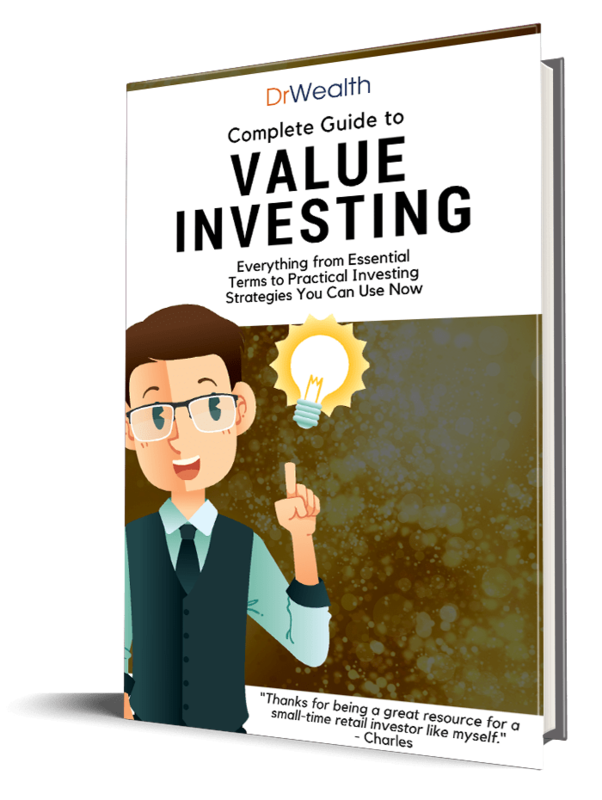 2 Case Studies that allows you to tap into the experience of profitable value investors.